Pre coated roofing sheets comes in range of material like bare galvalume, colour coated galvalume and pre painted G.I. The wind driven roof ventilation and louvers are its key features. 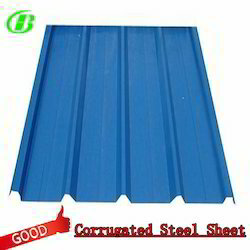 Catering to the requirements of our clients, we are involved in offering Precoated Roofing Sheet. Finish: Color Coated Profile Sheet. Pre Painted Galvanised Sheets, Pre Painted Galvalium Sheets, and Bare Galvalium. Our company is highly esteemed in offering Precoated Roofing Sheets to the clients. These products are manufactured by vendors using high grade components and modern technology at par with quality standards and norms. Precoated Roofing Sheets are available in various sizes and can be customized as per client's requirement.